Gold Jewellery Trends to Lookout For, Always! The iconic quote by fashion mogul Yves Saint Laurent coolly puts into words the dynamics of the world of fashion. Simply put, trends may come and go, but style, is here to stay. And it clicks for everything from apparel and footwear to even high-end, precious jewellery. Every season brings in bold new trends in the high-end jewellery market, but as much as we love catching up with the latest fads, there are some classical designs that will just never go out of style. And if there’s one thing the banks and fashionistas can agree on, it’s that gold is always in, racking up value and vogue with unchallenged panache. And when in India, do as the Indians do –stock up on your gold jewellery! Multi-stranded necklaces are a great yet simple way to show off a bit of classical flavour in your festive ensembles. And the best part is, it saves you the trouble of layering up with different neckpieces, when you can have it all in one striking design! 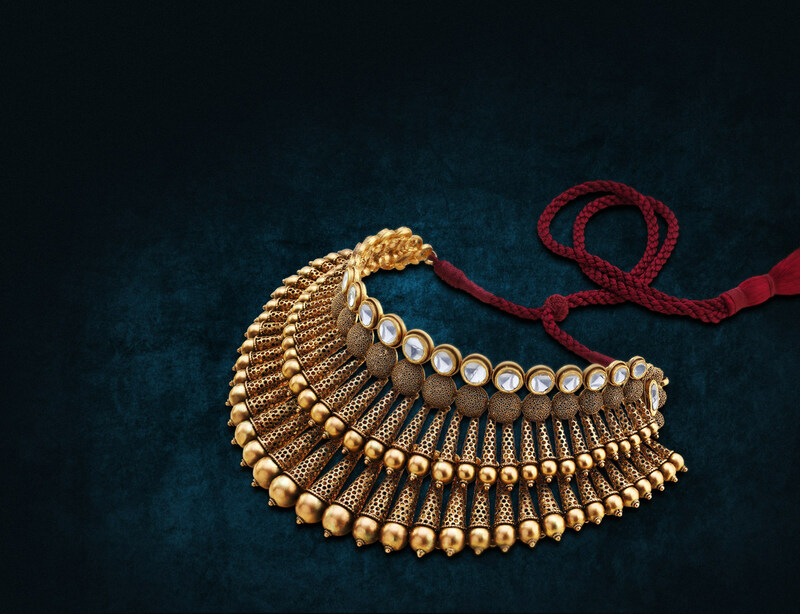 A fabulous layered neckpiece is all you need to wow this wedding season. If you’ve had an eye on the latest wave of jewellery trends in the west, you know the choker has made a strong comeback. But let me tell you something, in our good old culture, chokers have always been in vogue! Go in for beautifully sculpted, elaborate designs encrusted with gems if you’re looking for a statement neckpiece as a stand-alone piece of jewellery. Or if you want to bring out the whole arsenal of earrings, bangles, headgears and rings, then I’d suggest you opt for something smaller and simpler, like a basic gold choker with minimal detailing. Traditional temple jewellery is a classic route back to your roots. The antique style usually features layered necklaces with big, statement pendants. You can’t miss the unique, darker shade of gold in the finish. More sophisticated lustre than gaudy bling is the way to go, I say! Tribal Indian jewellery has always captured a wild and distinct spirit through eclectic designs. So if you’re feeling a little experimental, then tribal designs are a perfect fit. They’ll give your look an element of curiosity that’s just what you need to stand out this wedding season. The past few years have seen the return of the popular maang teeka, and you can bet your bottom dollar they’re here to stay. Nothing complements the typical long and lustrous Indian locks like a truly majestic headgear. Add a sprinkling of polki to the mix and you’ve got yourself a timeless piece of jewellery to pass down the generations! So what are you waiting for? Visit a jewelry shop near you and check the amazing collection of bridal jewlery they have in store for you.